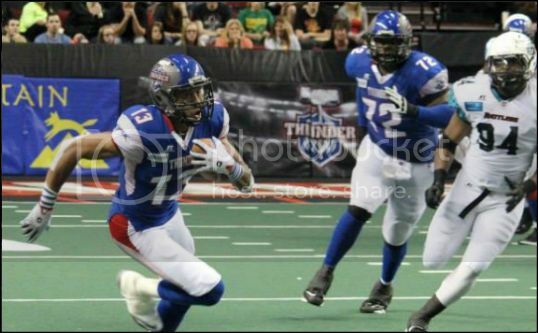 November 18, 2016 -- Former Portland Thunder wide receiver Eric Rogers is on the road to recovery and looking forward to 2017. After receiving 13 offers over the off-season from NFL teams, he signed a two-year deal with the San Francisco 49ers, but tore his ACL on Aug. 5. As a 6'4", 215-pound receiver for the Calgary Stampeders of the Canadian Football League, Rogers led the CFL with 1,448 yards receiving and 10 touchdowns in his second season in the league after playing sparingly in the final five games of the 2014 CFL season. The 24-year-old is a product of Division III's Cal Lutheran University. He has received plenty of attention over the past year. Rogers visited 16 NFL teams and had offers from 13 of them Schefter said. Rogers, who didn't see active competition until the Thunder's seventh game of the 2014 season, exploded on the scene in the team's win over the Tampa Bay Storm in week six. He collected 7 passes for 110 yards and 5 touchdowns in the contest, which was the second win in Portland franchise history (61-42). The 5 touchdowns is still a season (and, of course, franchise high). Rogers registered 73 catches for 903 yards and 27 touchdowns in just nine games during that season. All numbers led the Thunder for the season at the time of his departure to the Stampeders. Rogers was a key component in three Thunder wins over that span of games. While at California Lutheran University, Rogers collected 220 passes for 3,461 yards and 41 touchdowns over his four-year career. His 91 catches for 1,298 yards and 18 touchdowns as a senior earned him first-team All-American honors, and he was named Southern California Intercollegiate Athletic Conference Offensive Player of the year. Like many 49ers fans, Eric Rogers is already looking forward to 2017. Unlike those fans, the 49ers wide receiver began eying next season long before his team got off to a 1-8 start. Rogers tore his ACL on Aug. 5, less than a week into training camp, meaning he was never able to show if he could carry the momentum of his breakout season in Canada to the NFL. Last year, Rogers, 25, led the CFL in receiving yards (1,448), tied for the league lead in receiving touchdowns (10) and was third in receptions (87) with Calgary. His performance made him an intriguing prospect who received 13 contract offers after visiting 16 NFL teams. He worked out for the 49ers and the Eagles, when Chip Kelly was still their head coach. In January, on Kelly’s first day with 49ers, one of his first calls was to Rogers, who subsequently signed a two-year contract. Rogers, 6-foot-4 and 210 pounds, has the size Kelly prizes in a wideout. And he’s been told he’ll be in the mix to compete for a roster spot in 2017. First, Rogers, who played at Division III Cal Lutheran and has never played in a NFL regular-season game, has to get healthy. He said his rehabilitation, which is being done at the team facility, is coming along slowly, but he hopes to be jogging by the end of the regular season, with a eye to being medically cleared before training camp. The 49ers will need to address their wide receiver corps in the offseason and Rogers hopes to be part of the upgrade. To read the entire article on sfgate.com, click 49ers WR Rogers looking to 2017.